I just flew in from Monday’s blog, and boy are my arms tired! I will now tell you everything that has occurred since then. We left our kids with gaga and basketball, and some Rikudiyah (our camp-wide dancing competition) practice. We made a quick pita snack before heading into the bunks to shower. We then transitioned into erev (evening) high school! 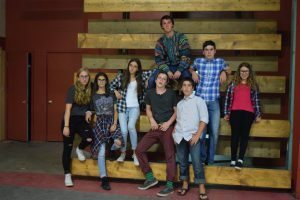 Between fake standardized tests about Yavneh, practicing driving on scooters, and learning about healthy eating, the chanichim (campers) were suddenly introspective and insightful about their coming year. Bedtime brought further reflection. Wednesday was our last normal morning of kitah (class), schiyah (swim), and chug (elective). The afternoon brought our final sports and swim before Rikudiyah. Levi’im performed valiantly, and the end brought a surprise. Amidst fireworks and bubble tag, Maccabiah (our camp-wide color war) began!!!!! The kids heard their teams and rushed in to a team meeting. Despite being split down the middle, both the banot (girls) and the banim (boys) felt particularly united as w e met in the tzrif (bunk) for the night. On Thursday, we went hiking up the Welch-Dickey Loop in New Hampshire. Though we had to wake up early, by the end, we wished we could have stayed late. We made a quick ice cream stop on the way back to camp for a special dinner of subs. 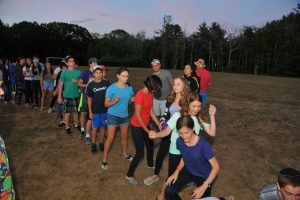 That night we started our first events of Maccabiah. We can’t wait to tell you more about the competition on Monday!! Until then!